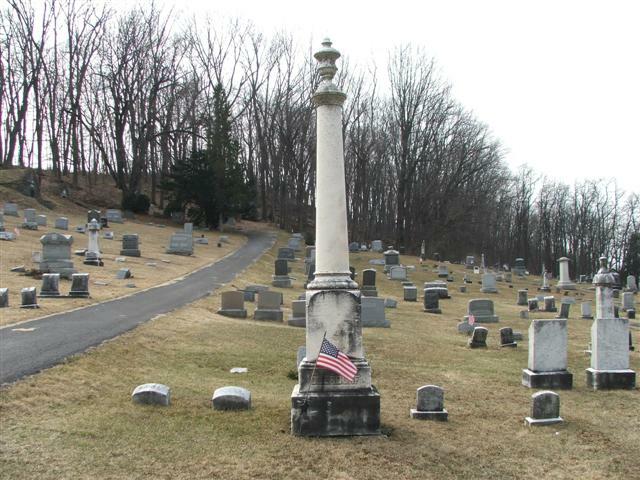 Listed as a private in company D, 152nd reg 3rd artillery, in Bell's History of Northumberland County Pennsylvania, page 432. The civil war was 1861-1865. Henry G, below, also served in the civil war, but in a different unit, so we can assume these really are two different Henry's, I think. :-) It IS possible He served in two different units, and it is possible that the M. is a misprint. But I'm working on the assumption that this is yet another Henry. In the name of God, Amen. I Henry Overturf of the Township of Gregg County of Union and state of Pennsylvania, being in good health of body and of sound and disposing memory praise be to God for the same) and being desirous to settle my worldly affairs while I have strength and capacity to do so. Do therefore make and declare this my last will and testament in the manner following that is to say I order that my funeral expenses and charges of proving this will to be paid by my three grand children Namely Robert Overturf one fourth, Joseph Overturf one half and Clarra Overturf intermarried with Jonathan Fisher one fourth. Those three being children of my son Samuel Overturf with his first wife. And I give and bequeath my two lots on which I live situatated in the village of Allenwood Township County and State above mentioned. Known as lot numbers ten /10) and eleven /11) on the original plot of Uniontown /now Allenwood) as laid out by MCurdy [C could be an L] ) situated on the south side of Broadway Bounded by Broad Street, Columbia Street, Arbuckles lot and Robert W. Brown’s lot as follows ‘to ___ [just? ]” To Robert D. Overturf during his life and then to his heirs Fifty feet /50) in widths off south and of lots Nos eleven /11) and ten /10) from Columbia st to Robert W. Browns lot, along Arbuckles lot then twelve feet /12) to be left for an alley along the North side of said fifty feet lot to run from Columbia St to Robert W. Browns lot for the use of said three parties mentioned in this will. Then fifty five feet /55) on Broad Street (commencing on Robert W Browns lot) off lot number ten /10) on and the same width back to the said alley of twelve feet /12) before mentioned along Robert W Browns lot be given and bequeathed to Clarra Fisher nee Overturf during her life time and at her death to her Heirs, and the balance of lots Nos Ten /10) and eleven /11) not disposed of to be given and bequeathed to Joseph Overturf during his natural life time and at his death to his Heirs. Which will be all of lot No Eleven on Broad Stree and Eleven freet /11) of lot No Ten /10) on said street allongColumbia street to the afore said alley of Twelve feet /12) wide before mentioned. My Bureau I give to my great granddaughter Elizabeth Fisher daughter of Jonathan and Clarra Overturf Fisher. "by my three grandchildren, namely Robert D. Overturf, Joseph Overturf, and Clarra intermarried with Jonathan Fisher" and "Those three being children of my son Samuel with his first wife." Owned land in Allenwood PA - the boundaries are spelled out in the will. Codicil also revokes power of attorney given to Robert "some time ago to attend to a law suit I had commenced in Elk County Penna to recover some land". Not listed in Washington Twp this year. Where did he go? PA in 1854- even tho 1850 census placed Samuel in Lycoming County. Maybe this is the Henry, father of Samuel below? That Samuel did live in Elk Twp. (note the mention of property there in the codicil of the will) But why would he only mention one of his sons and only those three grand children in his will? Buried in Mifflinburg Cemetery, in front of the Elias Church. "We have a volunteer who does an amazing amount of genealogy research. She put together a ring binder of as many of our buggy makers/dealers that she could. We have a little bit of information on Henry Gable Oberdorf, including his obituary (although the copy we have is not a great copy and difficult to read). We also have information on his son Elmer Curtin (Curt) Oberdorf. Both were buggy salesman, although Curt's obituary says he "learned the coach making business" so we're pretty sure he made buggies as well. We know they worked together in a "dealership". I don't have a Joseph on my list. 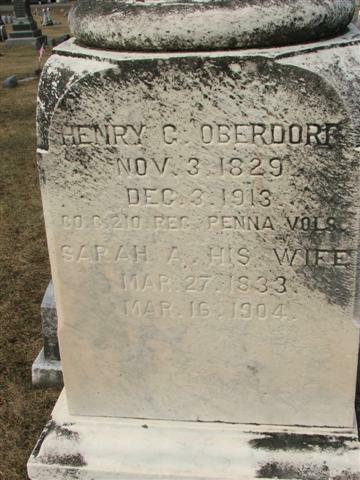 Henry's parents were Jacob and Catherine (Gable) Oberdorf. He married Sarah Rudy and they had seven children - Charles, Emma, Carrie, Sara, E. Curtin, Blanche and Catherine. We have no information about most of these children. We know that E. Curtin married Janette Hawke and they had one child, Sara Mae. He was only 46 when he died of tuberculosis." 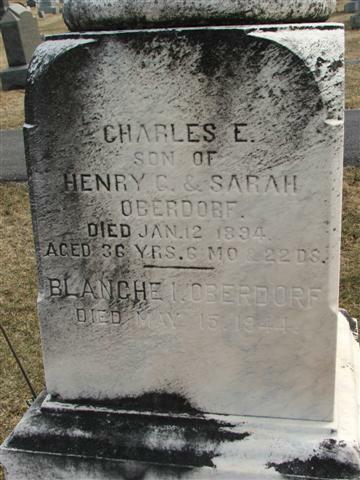 Joseph Oberdorf, son of John Christian, 1863-1923 is also buried in this cemetery. John Christian Oberdorf 1826-1905 states in his will that he is to be buried at this cemetery, beside his wife. Mary Lontz's book, Tombstone Inscrptions of Union County, lists them as buried here, but I have not yet located the stones. I, Henry Overdorf in Haines Township North’d County of Province Pennsylvania am in my full senses in good memory for which I thank God, so make and ordain this last will and Testament on the Seventh day of November in the year of our Lord one thousand seven hundred and seventy four, in the following meens. I recommend my soul in the hands of the Almighty God, and my body to the earth, and also give and bequeath I now­­­­­ ­­­­­ to my loving and worthy wife Catharine her chest and bed & bedstead, the bible her saddle and a hors to ride to the church, and the pewter furniture and the copper kettle and one iron pot. Also shall she live in this house while she is a widow, and my son John shall give her yearly ten bushels of wheat and take it to the mill and bring the flower in the house again and shall cut her firewood and take it to the hous as much as she will want. Further should he give her yearly twelve pounds of hecheled flax and twelve pounds of tow [two] and six bushels of turnips and six bushels of patatos and seventy five pounds of hogs meat and she shall have one cow for her use, which she chuses and my son John shall feed the cow thrue the winter lik his own and in paster, and he shall gave her a part of the garden growths further shall she have her spinning wheel and likewise the real [reel] and the big wheel for her use and the table shall remain in the house and the above mentioned articles shall be her own while she lives as a widow further shall my children divide the cattle to one like to the other that is to say that my don John and my daughter Elisabeth further shall my don John keep my daughters share of the cattle until she is married towards it he shall have the benefit thereof and she shall have one half ore moyet of the calfe of her cattle fu5ther shall my son John have three hed of hors kind my saddle andall the geers wagon and plow and harrow and my tools and what belongs to the farming besness and the Win [wind] Mill shall be praised and the half of it shall be pay to my daughter Elisabeth but the rest of the housel furniture shall be praised and hoever will keep it shall give goods to the other in money and further shall my son John shall the one half the land 1150 acres so that the debts thereon may be paid and the other 150 acres he is to have for his share, that is to say where we live on and afterwards shall he pay two hundred pounds to my daughter Elisabeth that is to say when she is twenty years of age and there shall he gave her for the first payment fifty pounds if he kan without his damage, but if he should suffer damages by it he is to give her only twenty five pounds and then he shall give her twenty five pounds yearly until the rest of the two hundred pounds is paid further shall she have one horse fit to plow with and when she marries also shall my daughter Elisabeth help my don John to work in the time of harvest and hay making until he is done and at any time when he is in need of her, and ever winter four weeks of spinning tword that shall he son one quarter of an acre of flax every year during that time that she lives single with him, the above mentioned she is to do so long as she is single, and the rest of the time she is to have for herself. And he shall give her the boarding while she is cleaning and spinning her flax, so I order herewith my son John and Philip Voneda for my executors I also testify herewith that this is and shall be my last will and testament which I acknowledge with my own hand and seal this seventeenth day of November the year of our Lord One thousand seven hundred and ninety four Henry Oberdorf . Witnesses present George Geiswhite Michael Motz Northumberland County ____ [fst? Pa?]. Be it remembered that on the seventeenth day of May 1796 Michael Motz & George Geistweed the two subscribing witnesses to the foregoing will who being duly sworn according to the law with that they are personally present and did see Henry Oberdorf the testator sign seal and declare the foregoing writing to he his last will and testament & that at the time of so publishing the said will he was of sound mind and disposing mind and memory. As the deponents do believe according to their knowledge and best of their understanding that the deponents wrote their names as witnesses in the presence of each other and further saith not George Geiswite, Michael Motz sworn subscribers this same date and year before me. Jn. Simpsen RegL. CENSUS: 1840 Bloom Twp., Fairfield Co., OH p 5 line 29. Henry Oberdurf. One male 40-50, one female 5-10, one female 10-15, one female 15-20, one female 20-30, one female 50-60.
and retained the name of Oberdorf. would move to this county (Butler) from Penn. Needham. That is where Helen Overturf met Melville and they were married. Samuel bought the Miller home place near Aredale."